This used to be made by the farmers to preserve their meat. 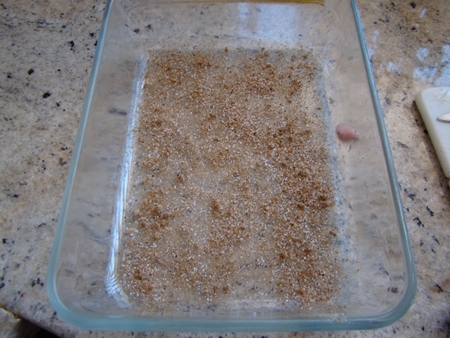 In a container sprinkle some spices. 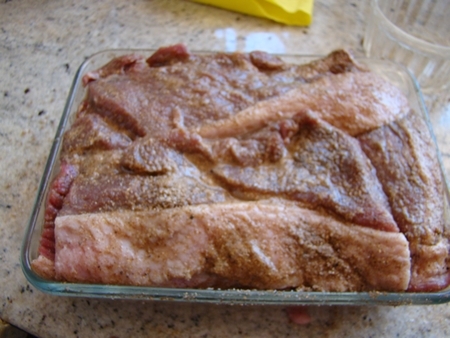 Put the first layers of meat, then sprinkle spices and some vinegar on the meat and repeat until all is done. Into to the fridge it goes for 24 hours. 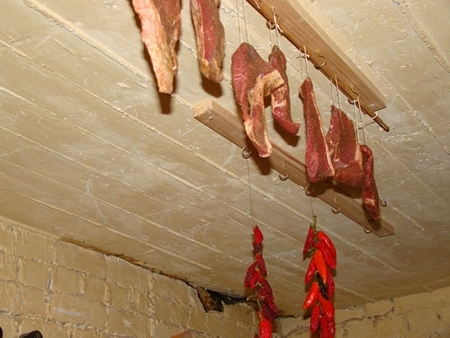 Hang the meat in the cellar with a fan for air circulation for 7 days. It has a great taste. a) What purpose does the bicarbonate of soda serve? I am guessing to help in drying or perhaps to counteract the vinegar? b) I am not familiar with brown vinegar - is that the same as we call malt vinegar here in the US? 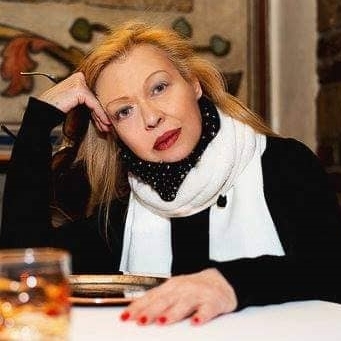 Thank you for posting, my friend! 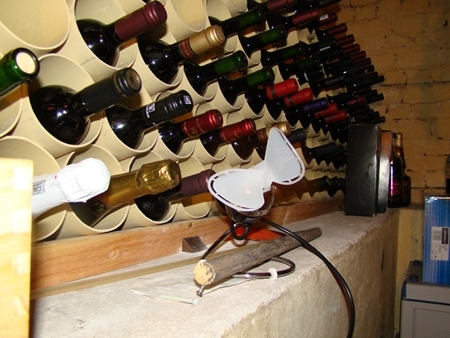 It looks wonderfully delicious, and I love your wine/meat cellar! 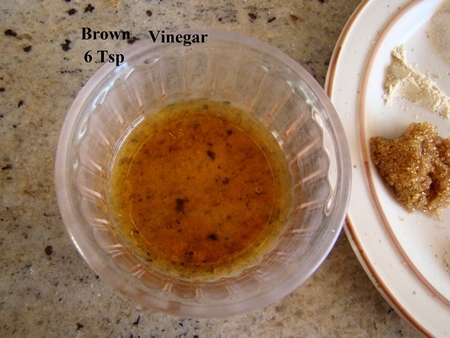 The vinegar is a brown spirit or malt vinegar. 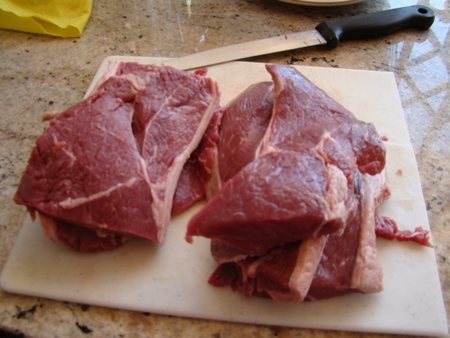 The vinegar and the bicarbonate of soda is to protect the meat from bacteria. Biltong from venison is a marriage from heaven. I started a batch of Ahron's biltong tonight, using 2 pounds of hind-quarter roast from a mule deer. 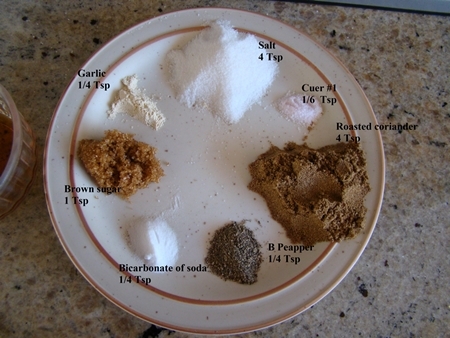 We layered the spice mix, venison and a total of 6 teaspoons of malt vinegar in a large ziplock bag; after sealing the bag closed, we gently massaged the it and its contents in order to ensure that the cure and spices were evenly distributed, then put the bag into the refrigerator. 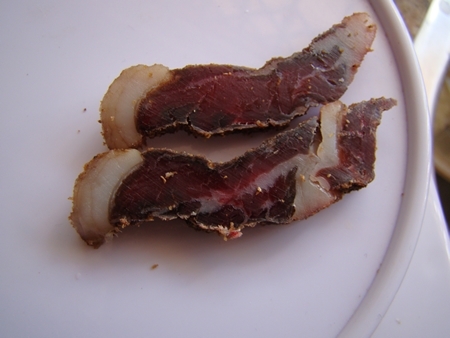 Once the 24-hour curing time has passed, we'll dry the biltong as described above. Judging by the aroma coming from this combination of spices, I am guessing that this will be some great stuff! 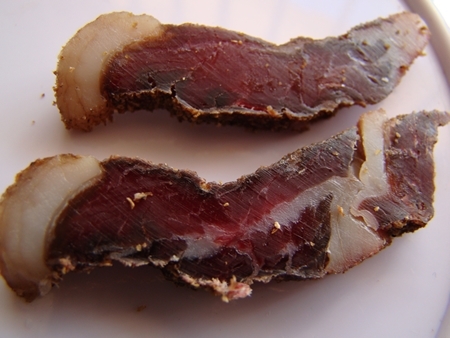 Our biltong actually cured for 48 hours instead of 24, simply due to our being busy...no big deal. 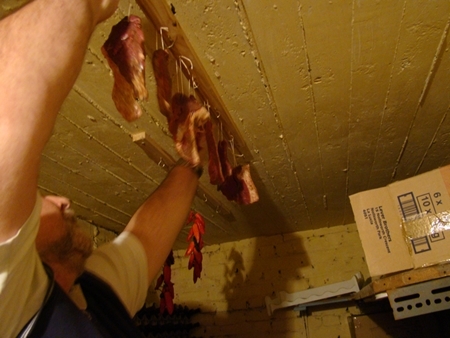 We placed the cured meat on racks in an enclosed space with good airflow (safe from our cats!) and are currently waiting out the drying time. Our slices of venison are a little smaller and thinner than those shown in Ahron's photos; more like elongated medallions, rather than strips. Because of this, the drying time may be different; however, our airflow is not going to be quite as good due to the enclosed space, so it might even out. This combination smells really nice; the garlic and coriander are a match made in Heaven, and the elements of the malt vinegar add a really nice depth. I believe that this is going to turn out very well. 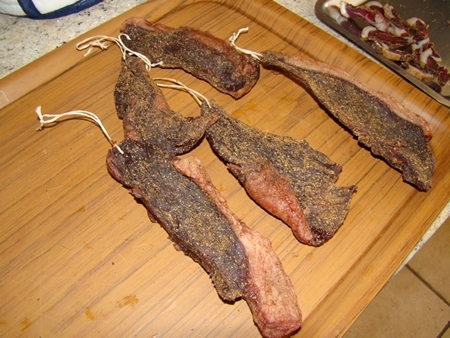 Well, our first attempt at biltong was indeed a success, and I am hooked! It tasted great, and I enjoyed the texture, which is slightly different than jerky due to the thickness of the cuts. The flavor combination is just about perfect, in my opinion, and I was surprised that such a small amount of garlic went as far as it did. The coriander was definitely a star of this, providing some taste experience that hadn't really explored before, and the brown/malt vinegar was another great choice, as making this a unique treat that is sure to be a favourite. I highly recommend that anyone with an interest should give this a try - you won't be disappointed! I believe you two should consider opening a tiny bistro !! I’ve wanted to try this for a while. I think after the first of the year I’ll give it a try. I plan to cure in a ziplock bag. For the 2 lbs. of meat what would be the correct amount of vinegar to add? Thanks. Sorry, I missed the 6 tsp under the photo. I’ll report back after it is done. Yep, that's it; 6 tablespoons. With luck, I'll be getting another batch of this going over the coming weekend.